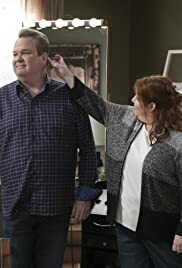 Jay teaches Joe how to play golf but he and Gloria both push him into becoming too competitive. Mitch and Cam host a party for Lily and her friends. Claire thinks that the Homeowners Association turned her application to build a shed on her own property. Phil Dunphy: We got our batting cage. Sort of. Luke Dunphy: Come on, mom. Can we have a turn? Claire Dunphy: Not after the day I had! Phil Dunphy: C'mon, buddy. Maybe next time. The Ed O'Neil part is definitely funny but surprisingly the other two parts of it doesn't have much to offer as it floats on the same coast as earlier. 2 of 6 people found this review helpful. Was this review helpful to you?